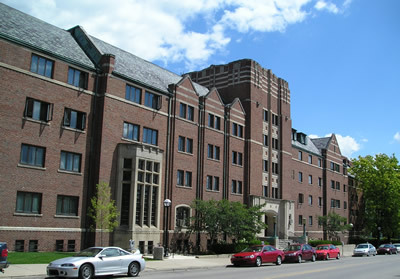 Originally constructed in 1937, West Quadrangle, combined with the Cambridge House portion of the Michigan Union, is an approximately 370,000-gross-square-foot residence hall housing approximately 1,100 students. As part of the ongoing Residential Life Initiative, we propose a deep renovation of West Quadrangle and Cambridge House. Dining services for West Quadrangle residents will be relocated to South Quadrangle allowing renovation of the West Quadrangle dining area for much-needed spaces for student interaction, creation of community, and living and learning activities. Infrastructure upgrades will include: new plumbing, heating, cooling, and ventilation systems; roof replacement; renovated bath facilities; exterior envelope and window repairs; and accessibility improvements.